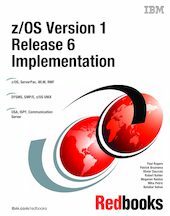 This IBM Redbooks publication discusses the many enhancements to z/OS Version 1 Release 6, and provides information to help you install, tailor, and configure this release. It first offers a broad overview of z/OS Version 1 Release 6, and then goes into detail on how to install and tailor z/OS and the many components that have been enhanced, such as: the z/OS base control program (BCP), ServerPac, DFSMS, Workload Manager (WLM), RMF, SMP/E, z/OS UNIX, ISPF, and Communication Server. This book is intended for systems programmers and administrators responsible for customizing, installing, and migrating to the newest levels of z/OS.